VR ONE is the first and only VR headset that is made with a leading-edge optical design and ZEISS precision optics. When you put on a set of VR goggles you should get the premium experience you expect. Currently compatible with iPhone 6, Samsung Galaxy S4, S5, S6, Nexus 5, and LG-G3 smartphones, plus hundreds of apps available for mobile VR devices. 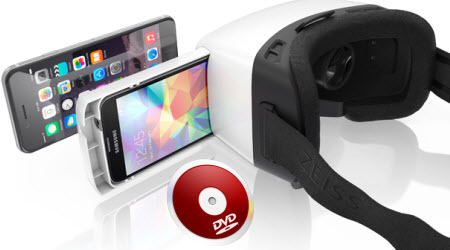 If you have some movies on DVD disc, it is a brilliant ideal to view your own DVD movies on VR One via mobile devices in VR One Cinema. Simply follow this simple tutorial to get the work done! 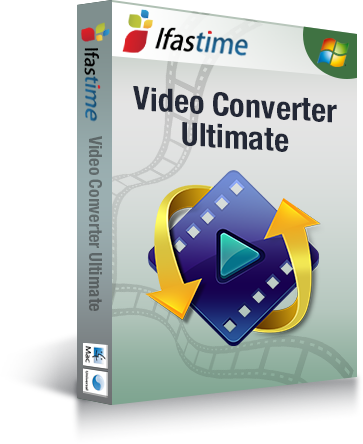 Here a superb and credible video converter- iFastime Video Converter Ultimate is highly recommended. With it, you can rip DVD movie no matter from DVD disc or DVD folder as well as Blu-ray to ZEISS VR One compatible SBS 3D MOV or MP4 videos with fast speed and excellent output quality. What's more, it can output 3D formats with three kinds of 3D effects: Side-by-Side, Top-Bottom, and Anaglyph for watching on 3D TV, 3D projector or other 3D Players. If you're a Mac user, simply turn to iFastime Video Converter Ultimate for Mac (El Capitan included), which has the same function as the Windows version. 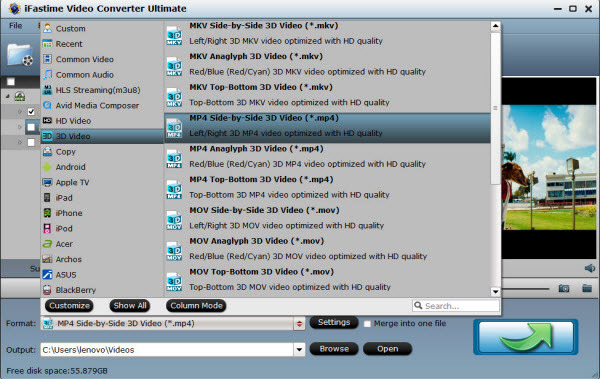 The below guide taks the Windows screenshots for example to show you how to rip DVD movies for playback on VR One with best 3D effect. Step 1: Launch the best DVD to VR One Converter. Click the "Load file(s)" button to add DVD movie to it. ISO and IFO files are also supported. After the movies are loaded, you can preview them on the right viewing window and adjust volume or take snapshots freely. Step 2: As we mentioned above, VR One supports MP4, MOV, etc format. You can click the "Format" bar and choose one from "Common Video" list. 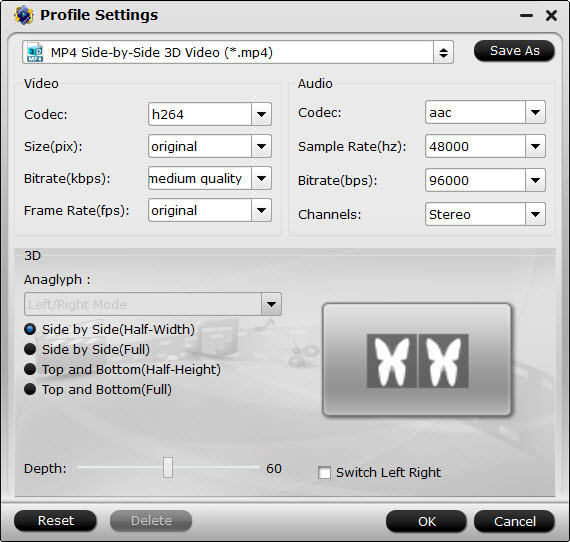 If you want to play 3D movie with VR One, you can choose "MP4 Side-by-Side 3D Video (*.mp4)" or "MOV Side-by-Side 3D Video (*.mov)" from "3D Video" profile list. Step 3: By clicking the "Settings" button, you can modify the video/audio parameters. Movies in 720p resolution are best for watching in the VR ONE Cinema. Note that 1920x1080 compressed side-by-side 3D should be resampled to 1920x540 resolution full side-by-side resolution. Step 4: The last step is to press the "Start conversion" button at the bottom right corner to start converting DVD files to VR One. The conversion takes a few minutes, if you don't have time to wait, you can choose "Shut down computer after conversion". Then your computer will be turned off automatically after the conversion is finished. Adding movies to the VR One Cinema app is very easy. Since you will need to save the movies to your phone, please plug the phone into your computer. And open the Apps Menu (Step 2). 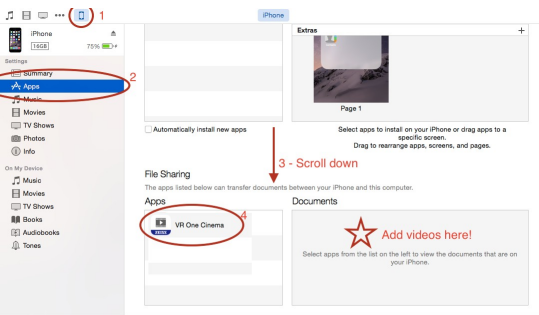 If you scroll down (Step 3) you will find the VR One Cinema app listed under the "File Sharing" menu. Just select it, and either drag and drop videos into the window on the side, or click the "Add" button to search through your folders (Step 4). And that's it! All the videos you add here will be listed under the "Movies" folder inside the app. The VR One Cinema app can play ".mov" and ".mp4" file formats. It is also important to note that if you have a side-by-side video that is specially formatted for 3D, you can simply add the keyword "SBS" to the file name of the video, and the app will automatically show the correct content for each eye. Enjoy an awesome virtual reality movie theater experience! iFastime Video Converter Ultimate is not only designed as the top-notch yet DVD to VR One converter but also the all-conquering movie conversion program to transform almost all HD and SD videos like 3D YouTube movies, 3D YIFY to VR One without any barrier. More unbelievable, importing your movies to PowerDirector/Pinnacle Studio for editing is solely like a hot knife through butter. No better ripper/converter out there. No format is too obscure for this program. Seriously, I’m watching DVD rips on my 3d glasses right now! Crazy. This program is the best based upon ease and high speed. You will find it out how easy and fast the conversion work is. Lovely page, Preserve the excellent job. Regards.